Minions and mug rugs? How much fun can one quilter have? Throw in some denim and you have a fun project! 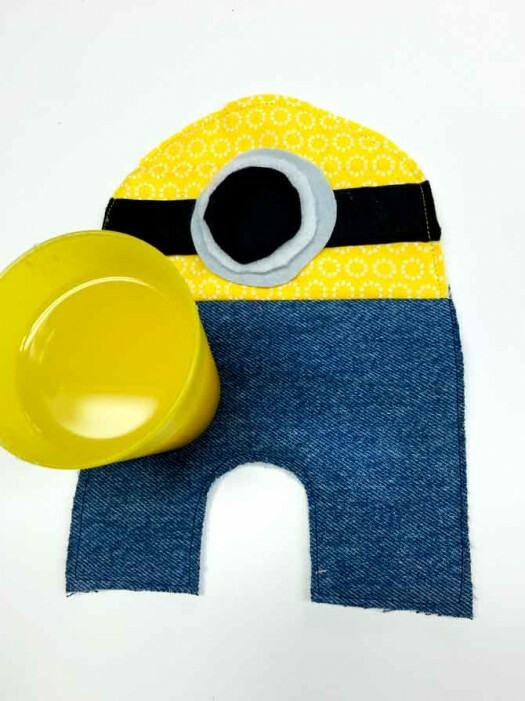 This post highlights how perfect denim can be in making a minion mug rug for a child. 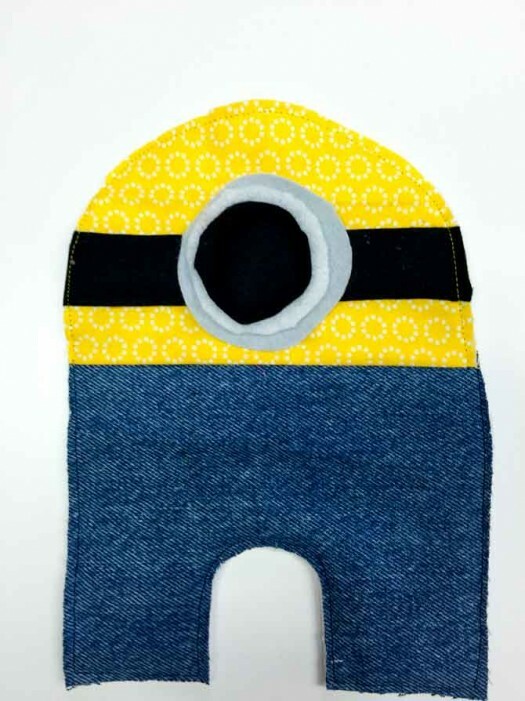 Minions are a smashing hit and denim is the perfect stand-in to make a mug rug last against the adventures a child will bring to it! Start by gathering a 6″ square of both denim and yellow print fabric, some bits of grey, white and black felt. You could also use fabric for the grey, white and black. I chose felt as I wanted a 3D effect. Don’t forget a bit of batting and backing. With your 6″ denim square, cut a small rectangle out of the bottom, to create pants for the minion, as shown below. 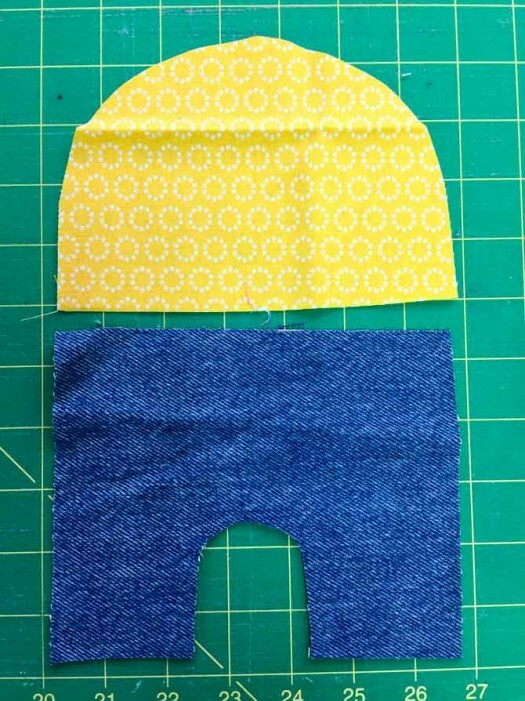 Cut the yellow square into a dome shape for the head of the minion. Cut out shapes for body and head of minion. Stitch the body and head together along the middle and press to head. 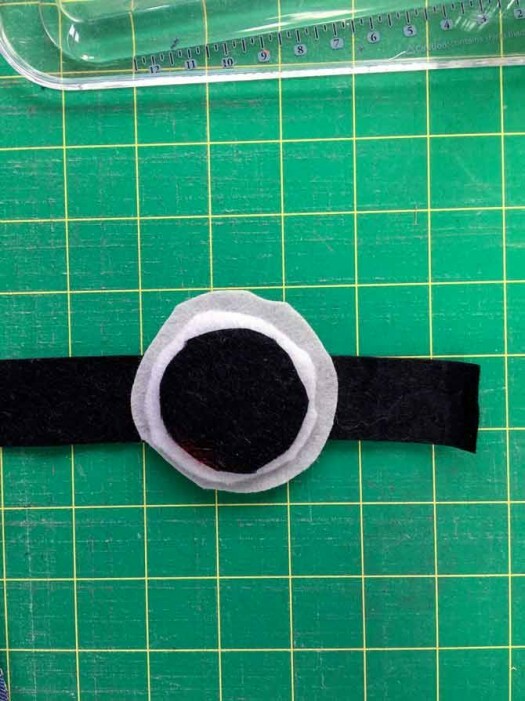 Cut out a 3/4″ x 6″ band from the black felt and cut out 3 circles as shown from the grey, black and white felt, with a 1/4″ difference in size between the circles. Layer black, white and grey and lay on top of band and pin to head of minion. I stitched right through all the layers of the circles a small circle to affix to the head. Cut out 3 circles from felt to make the eye of the minion. Layer the batting and backing under the minion. Quilt along black headband and outer perimeter of the minion. I straight stitched 1/4″ in as I would like it to fray a little. If you prefer no fraying, do a tight zigzag stitch along outside edge. How fun would it be to make up a bunch of minion mug rugs for a birthday party or give out as Christmas presents? The denim totally makes it! You could also increase the size and turn them into place-mats! I hope you enjoyed quilting with denim all week long. Look to your creativity and explore the many more possibilities to use denim in quilts.